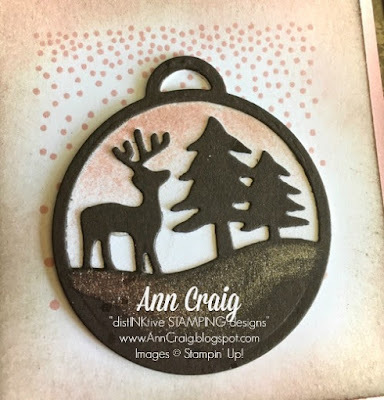 I made this Christmas Sampler to showcase the new Holiday Catalogue from Stampin' Up! If you haven't seen it yet and would like a copy, contact me and I will get one to you. 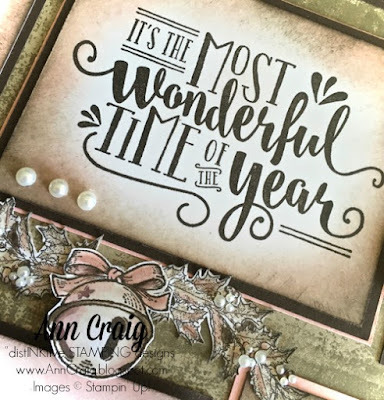 It is filled with so many gorgeous stamps and accessories that you need to look at it again and again to actually see all the wonderful inclusions. 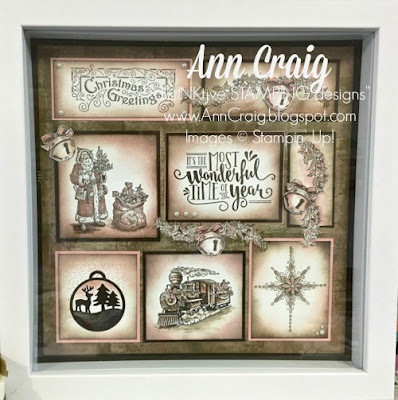 My Christmas Sampler showcases the traditional stamps and I've given them an antique look by using just 3 of Stampin' Up! 's classic ink colours: Early Espresso, Blushing Bride and Crumb Cake. 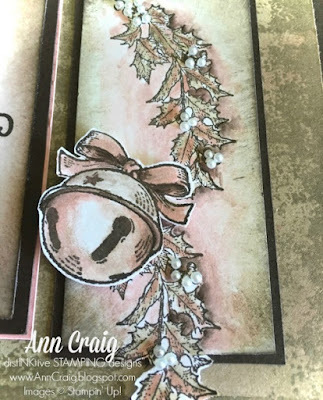 One of the Merry Tags Framelits stamped over a background stamp from the coordinating stamp set in the bundle. Can you see the Gold Wink of Stella added to the ground under the trees? This greeting says it all for me. I love Christmas and the joy it brings to our family when we all gather together to celebrate. I've added pearls to the holly berries and coloured the bells, holly and background with an Aqua Painter. I sponged the edges with Early Espresso and Blushing Bride. You may have noticed the background. That is a piece of 12 x 12' Crumb Cake card and I used one of the stamps from Timeless Textures to create the mottled, aged look that I wanted for this project. The traditional stamped images come from 2 stamp sets that caught my eye immediately: Father Christmas and Christmas Magic. You'll find them both on page 22 of the Holiday Catalogue. I'll list the products I used at the bottom of the post and you can order them (and all Stampin Up! products) via my On-line Store for quick delivery to your home.